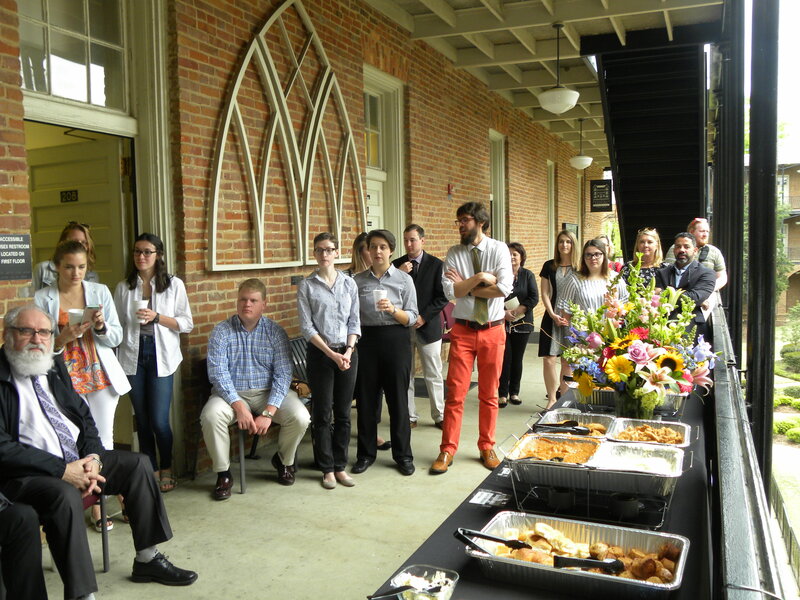 Yet another successful Honors Day has come and gone and, just like past years, we had much to celebrate, from noteworthy milestones from several of our undergraduate students to our Department’s first Master’s thesis defense. As always, we (well, Betty) captured the highlights of the day. 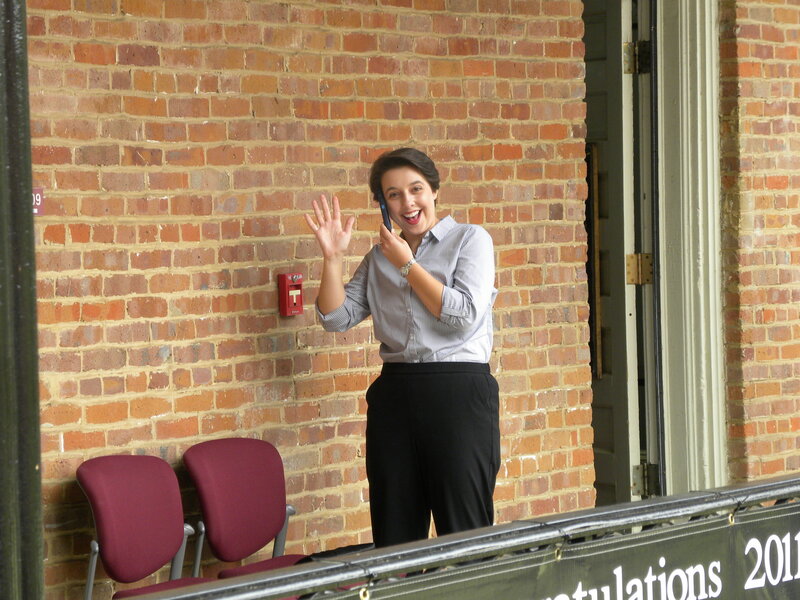 Yes, the banners now go from one end of the balcony to the other, so next year…? Colonize the third floor perhaps…? 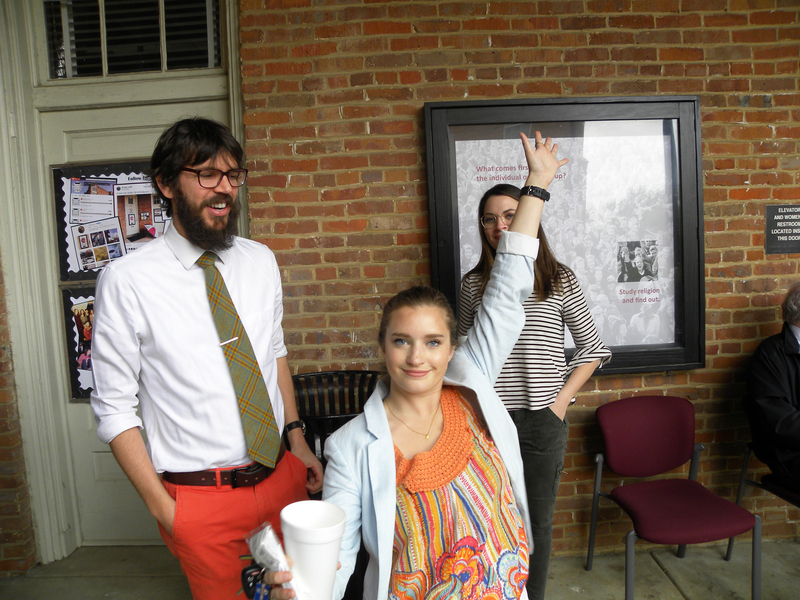 That’s Sierra Lawson (center), Prof. Mike Altman (left), and Keeley McMurrary (right), each unable to contain their excitement for the upcoming awards ceremony. 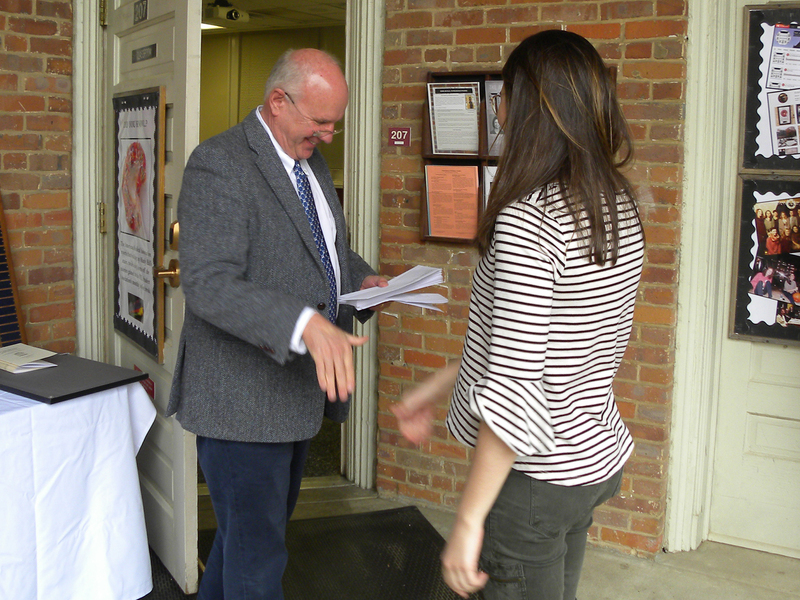 As in years past, some students were recognized earlier that morning at the Arts and Sciences Honors Day convocation (in Moody Music Hall), with the Department’s event taking place a little later, at noon, where a delicious lunch from Cypress Inn was served. 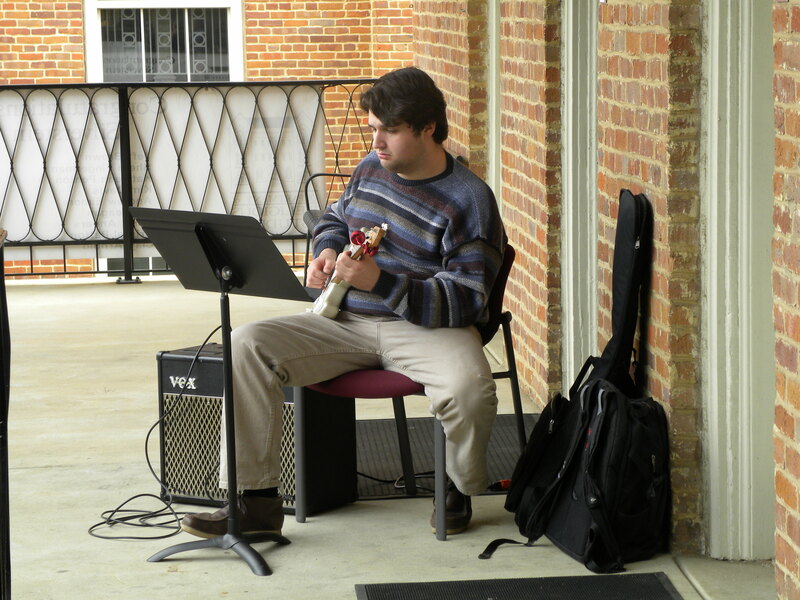 Yup, that’s Jimmy Herring, music student at UA, who provided some wonderful music for the event. 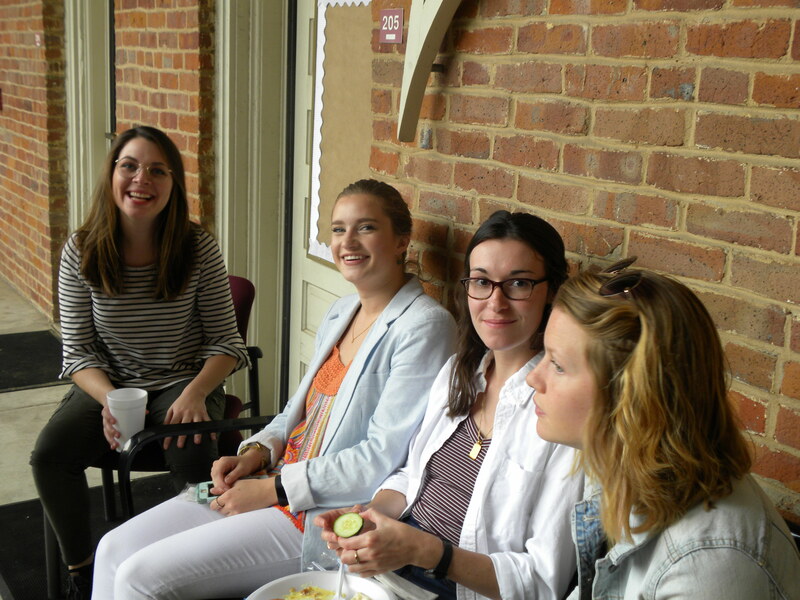 (Pictured from left to right) Keeley McMurrary, Sierra Lawson, and Emma Gibson (the latter two in our MA and the former entering the MA in the Fall) took their lunch outside to enjoy a bit of the live music the Department had for this year’s event. Of course, the students’ families were also present at the event. 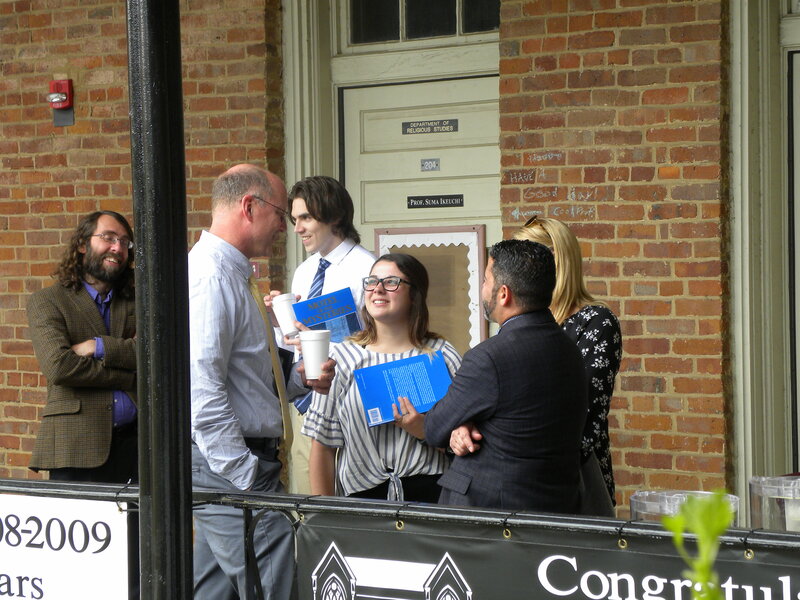 Pictured above is Parker Evans (left), and his mom, chatting with Prof. Russell McCutcheon and below Prof. Matthew Bagger (center) speaks with Sofia DeFaria and her family while Kyle Ashley (background center) talks with Prof. Steven Ramey. After the lunch, everyone took their places as Profs. 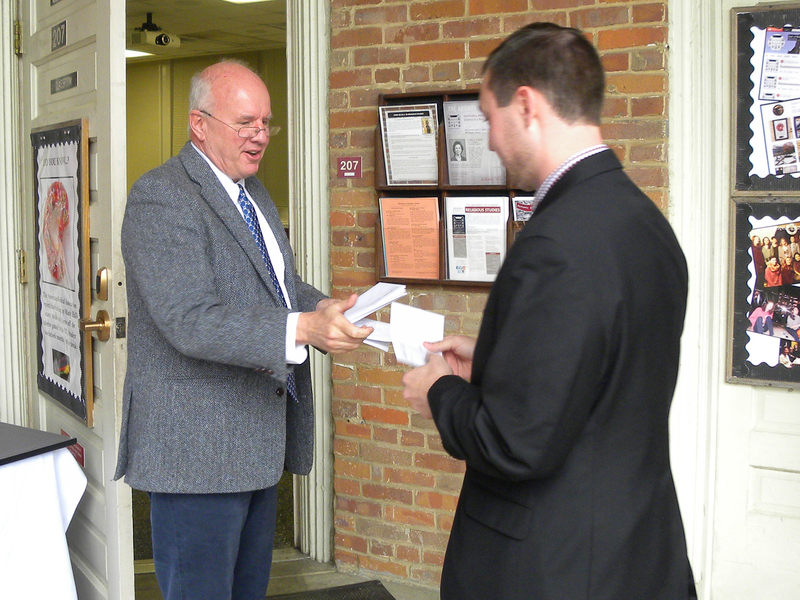 Ted Trost and Nathan Loewen prepared to present awards to this year’s Silverstein Scholars, (of which there were many). 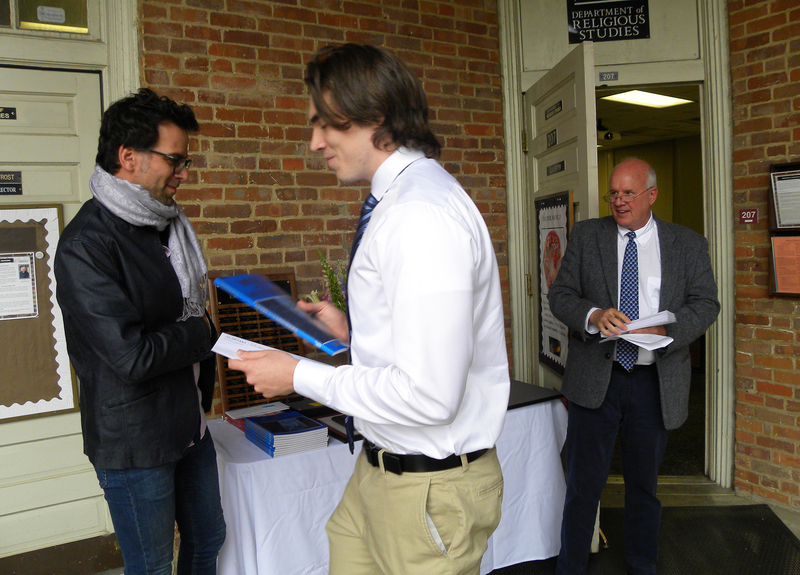 In addition to their scholarship, each received a copy of Motel of the Mysteries by David Macaulay — a book that is fun but critically sophisticated, not unlike REL students. 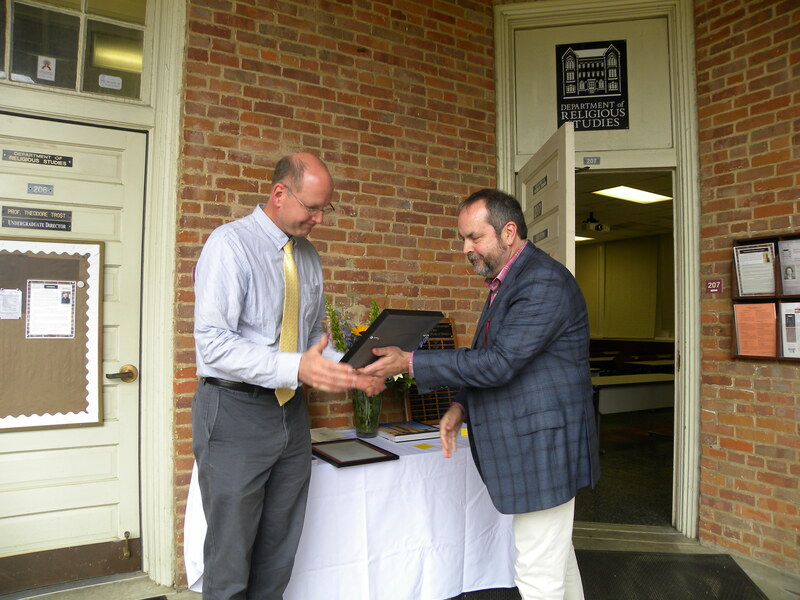 Andrew Dobry (top) was among the first to receive his award, followed by Ashley Eggert (bottom). 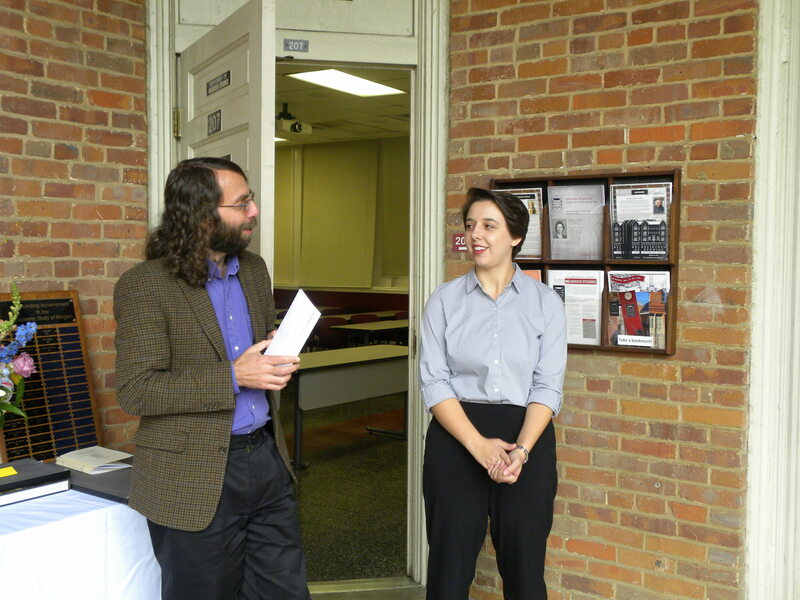 Keeley McMurray (top), who was recently awarded a competitive campus-wide fellowship, by the National Alumni Association, to begin work on her M.A. 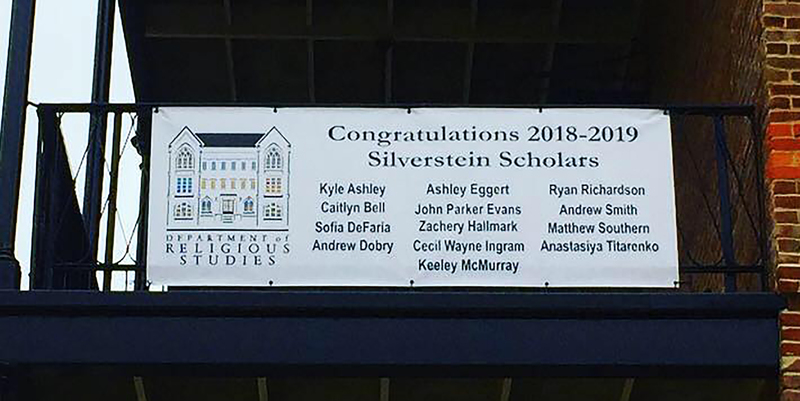 with us this Fall, and Kyle Ashley (bottom), one of next year’s RSSA officers, were both proud recipients of this year’s Silverstein Scholarship. 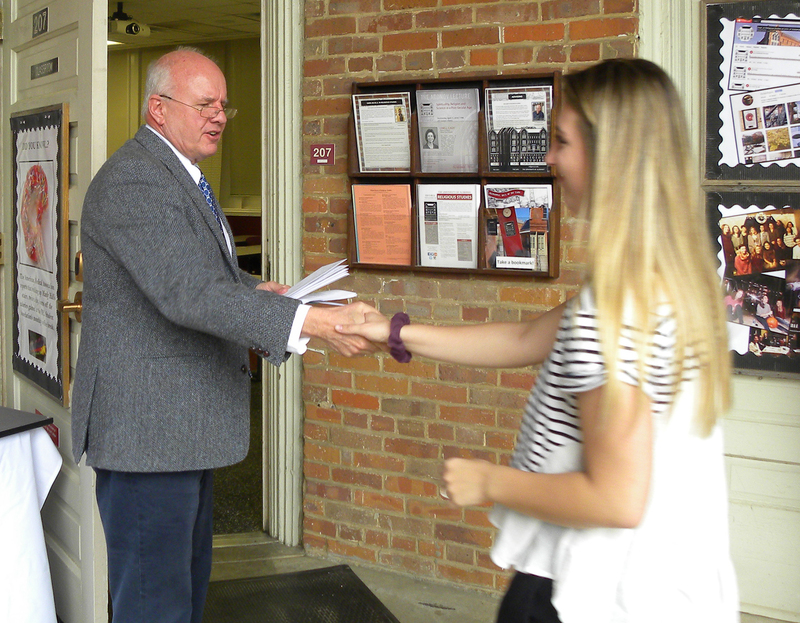 Sofia DeFaria (top) and Wayne Ingram (bottom) were both awarded Silverstein Scholarships. 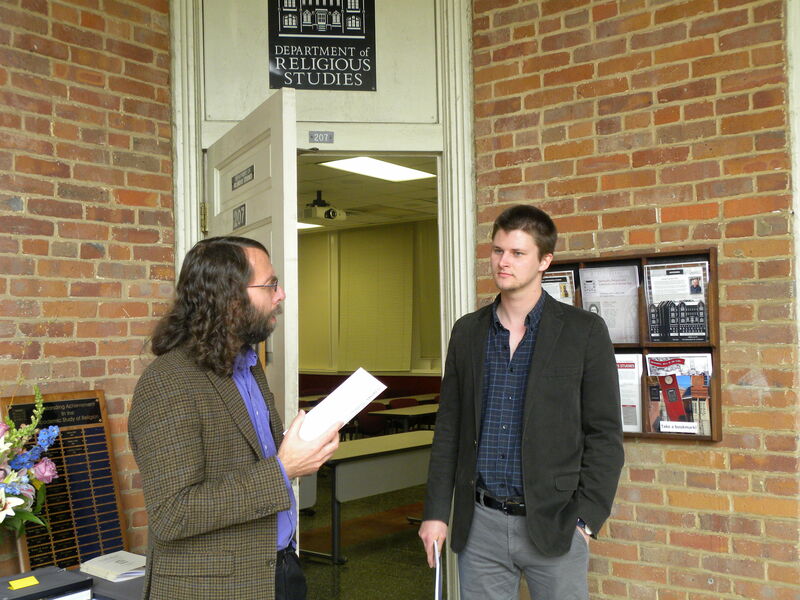 Zachary Hallmark (top) was also one of this year’s Silverstein Scholars. 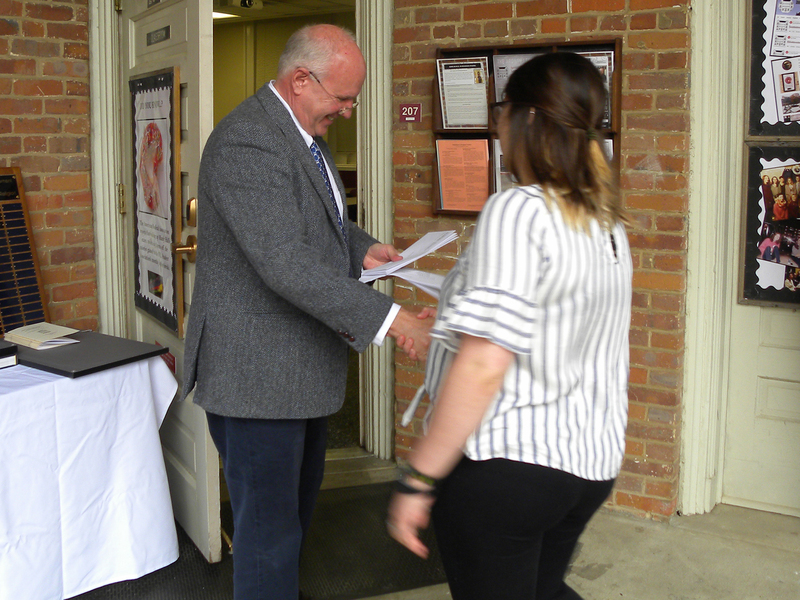 Next up Prof. Steven Ramey (below) presented our Outstanding Student awards–the three recipients, who were also recognized at the earlier A&S convocation that morning, were all also recipients of this year’s Silverstein Scholarship. Anastasiya Titarenko, who served as this year’s RSSA President, was the first to receive her award–we learned a bit about how much she’s been traveling in the past couple of years and her upcoming move to Buffalo to pursue a Masters degree. 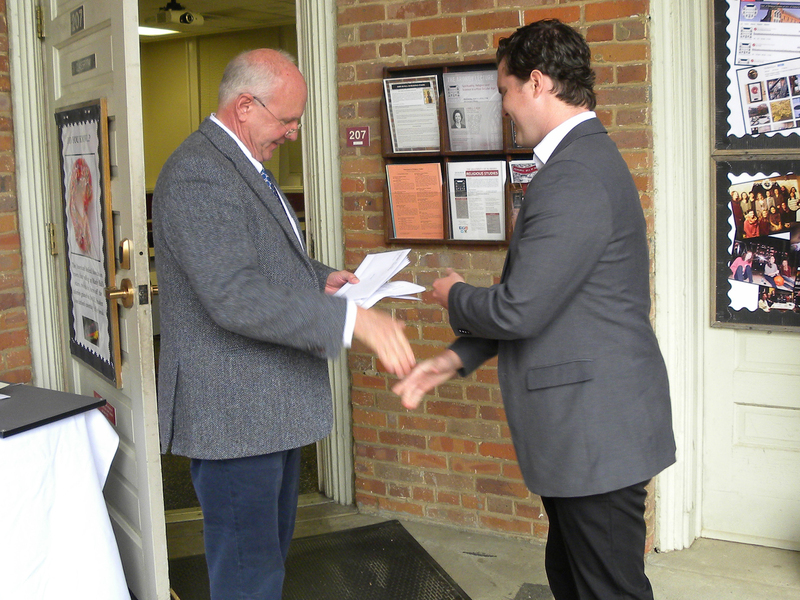 Parker Evans was the next recipient of this year’s award–he’ll be sticking around Manly Hall next year, to begin an MA in Gender and Race Studies. 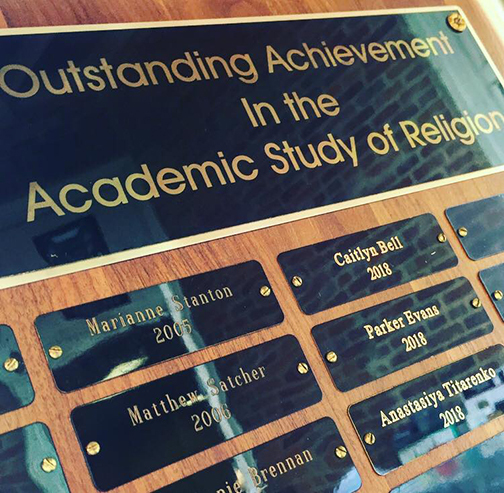 The last recipient of this year’s Outstanding Student award was Caity Bell–longtime main office student worker and, in the Fall, an MA student in REL. 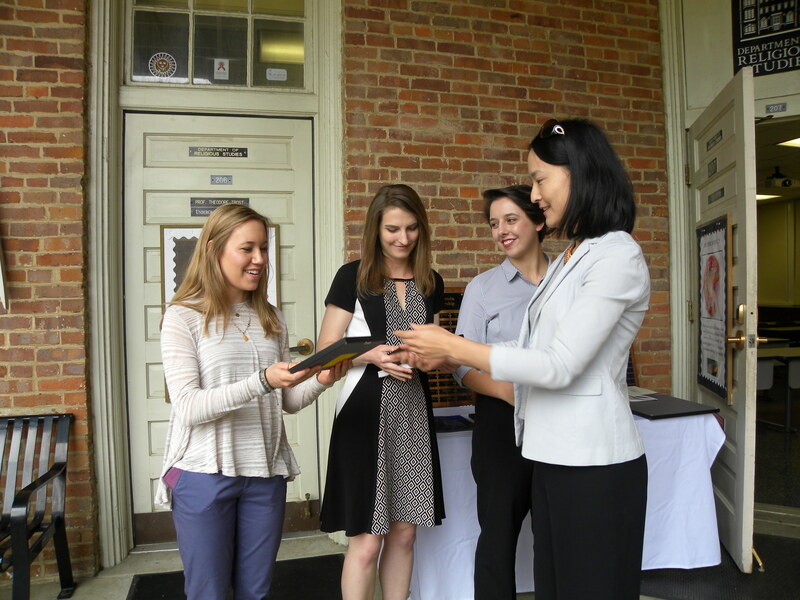 In addition to these awards, Prof. Suma Ikeuchi thanked the current RSSA officers (left to right: Ellie Cochran, Caity Bell, and Anastasiya Titarenko) for their service this semester, presenting each with a framed historic picture of Manly Hall. 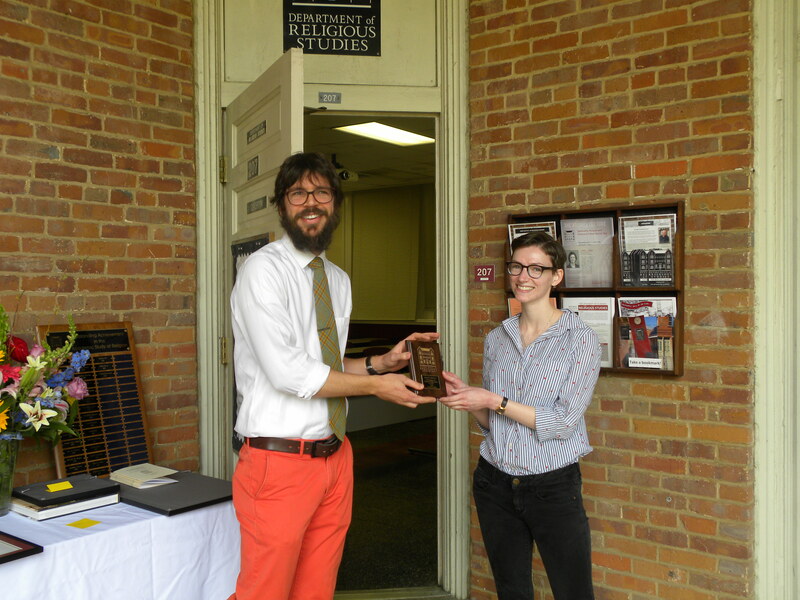 Moving on from our award-winning undergraduate students, this year the Department had the honor to present Sarah Griswold (below), graduating MA student, with a plaque commemorating the successful defense of her graduate thesis–the Department’s first! The framed cover page will soon hang in our seminar room. 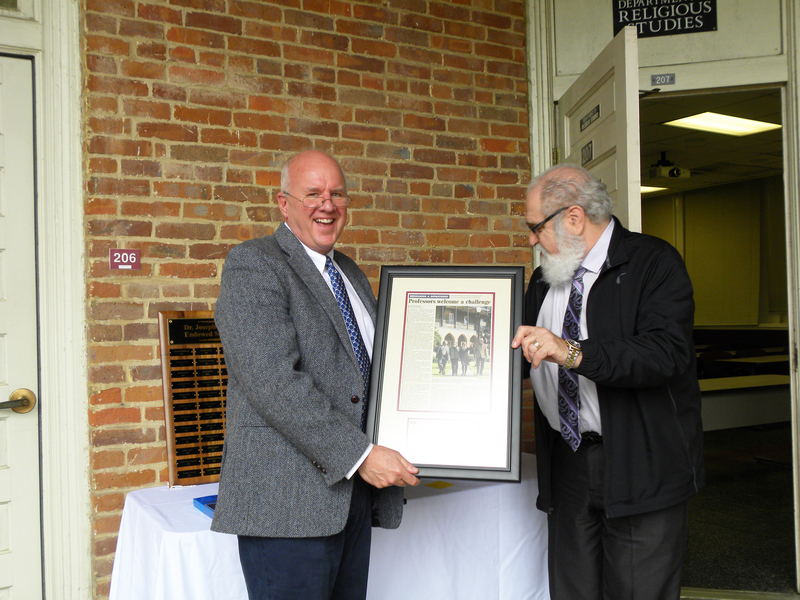 To kick-start these awards, Prof. Steve Jacobs (right) recognized Prof. Ted Trost’s 20 year service to this Department (working in both REL and New College) with a framed Tuscaloosa News article from his first year at the Department. Special thanks to Betty Dickey for keeping such extensive personnel files! 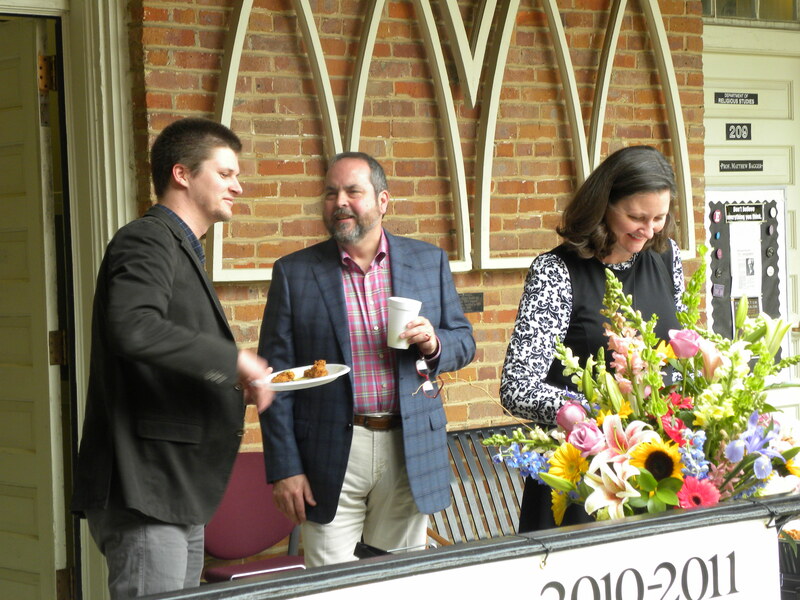 Prof. Russell McCutcheon then presented both Prof. Suma Ikeuchi (top) and Prof. Matthew Bagger (bottom) with farewell gifts. 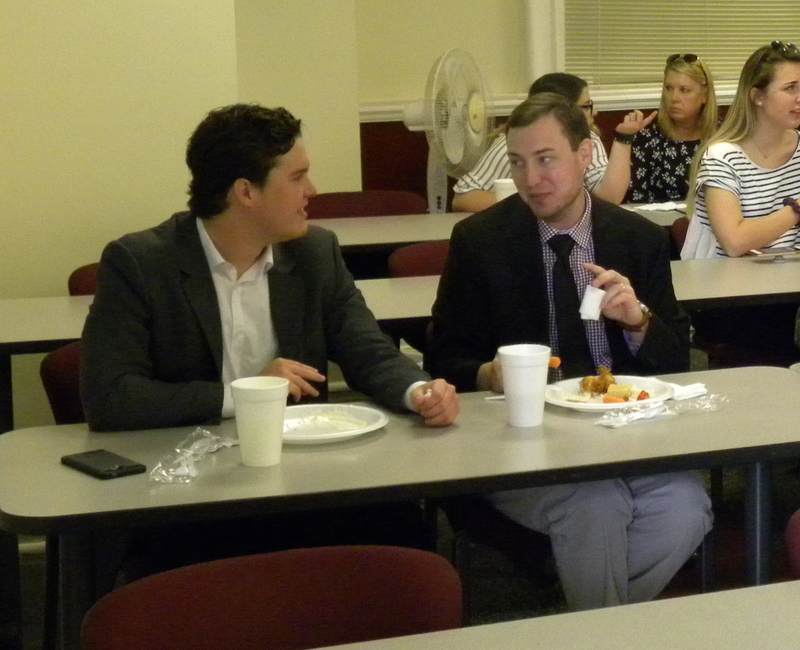 Our thanks to everyone who came to Manly Hall to celebrate with us and to eat all that catfish and smoked chicken. We’re very proud of all of our students and are looking forward to yet another incredible academic year in 2018-19. 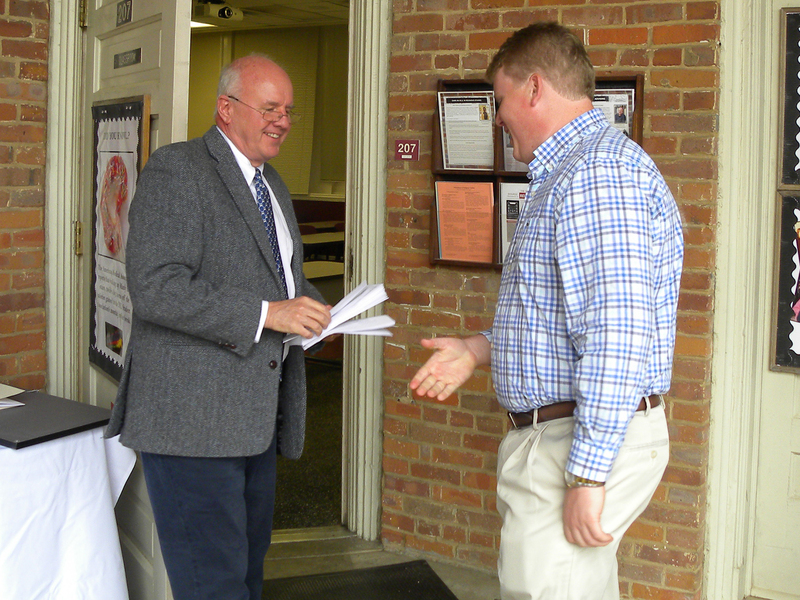 Special thanks to everyone who made this event possible, especially Betty Dickey for taking these excellent photos. 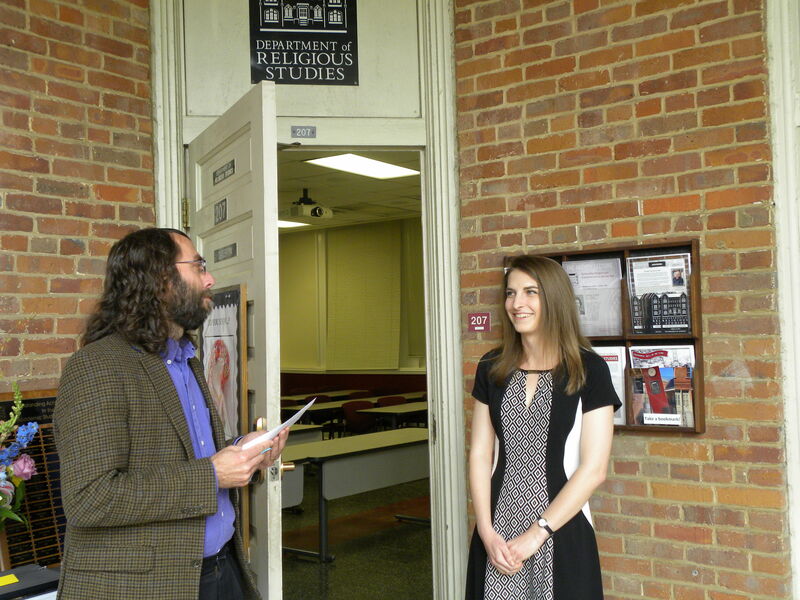 This entry was posted in Faculty Blog, Public Events, Relevance of Humanities, Religion in Culture and tagged 2018, Honors Day, Honors Day 2018 by Caity Bell. Bookmark the permalink.